My Little Pony Friendship is Magic Titles! I've been a My Little Pony fan since the early 1980s, when I used to play with and collect beautiful My Little Ponies toys! For one birthday I remember asking for (and receiving) a My Little Pony Show Stable. It was a little girl's dream come true! So imagine my delight when my only daughter followed in my footsteps with her love of My Little Ponies! She has a beautiful collection of ponies: some unicorns, some pegasuses, and some a combination of both. Her My Little Ponies have luxuriously long manes and tails, girly colours, and "magic" like sparkle, glitter, or jewels. 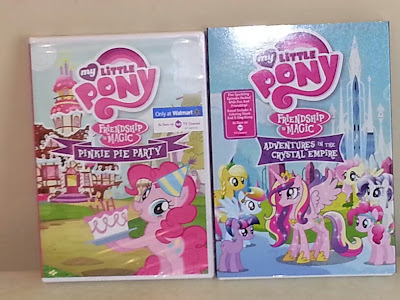 Needless to say, we were delighted to receive two My Little Pony Friendship is Magic dvds: Adventures of the Crystal Empire and Pinkie Pie Party! My Little Pony: Friendship is Magic is currently the #1 show on the Treehouse channel in Canada. Adventure of the Crystal Empire was just released April 2nd, and Pinky Pie Party will be released on April 16th in Canada! Adventures of the Crystal Empire is available both instore and on Amazon.com, and includes a sing-along bonus feature and a colouring sheet. Pinkie Pie Party is a Wal-Mart exclusive, which also includes a sing-along bonus feature and party activity kit. Each DVD includes 5 episodes and is priced at $14.97 CDN. All 5 of my kids, aged 2- to 7-years old (4 boys and 1 girl), congregated to watch My Little Pony: Adventures of the Crystal Empire. I didn't know if it would hold the boys' interest, given the girly theme of the film. However, all children sat for the whole movie presentation and really enjoyed it! I watched along too, and noticed the brightly coloured scenes that are the hallmark of the My Little Pony line. There is no denying the show definitely has a gorgeous look to it. Of interest, there were male characters "Shining Armour"--as well as a male bad guy--to add appeal for any young male viewers. 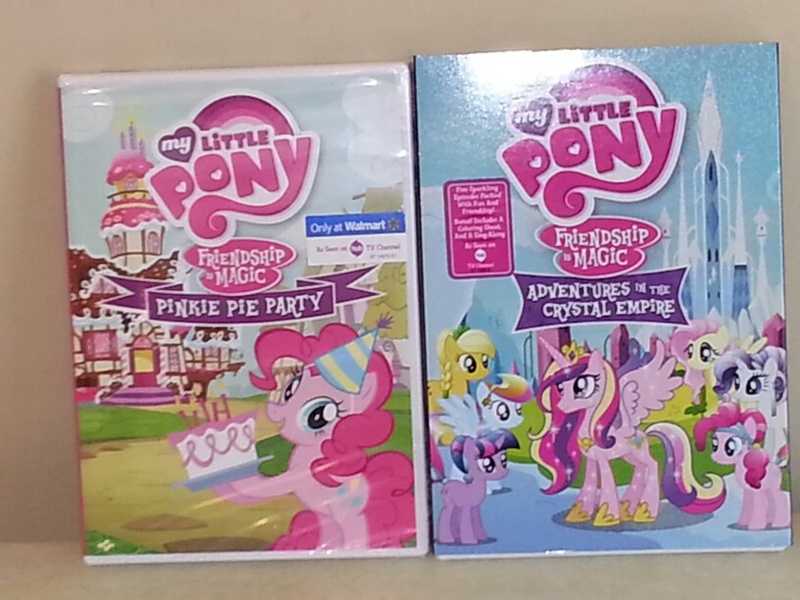 WIN My Little Pony Friendship is Magic: Adventures of the Crystal Empire AND Pinkie Pie Party DVDs! 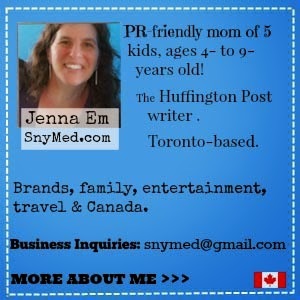 Open to Canada & USA, runs until Monday April 29th, 2013. Leave a COMMENT below stating if you know someone who would LOVE these two (2) DVDs, then fill out the entry form below. GOOD LUCK! WIN Two (2) My Little Pony Friendship Is Magic DVDs! My daughter would love these! She is a HUGE My Little Pony fan! These would be great for my niece! My daughter would absolutely love these DVD's! My daughter would love these dvd's! My daughters love My Little Pony and would be thrilled if Mommy won these DVDs! Yes, a little girl that I babysit for. I would love to win this for m daughter! My little granddaughter is very much a "My Little Pony" fan. She insists on being called Applejack and her daddy is Rainbow Dash. She loves My Little Pony. my little girl loves my little pony. pooni as she says.. could watch all day long..
My 5 year old LOVES MLP! She would be ecstatic!! My daughter would love to have these! She just had a birthday! Seeing as how my daughter eats and sleeps My Little Pony, I think she would go ape over this series. Seeing as how my daughter eats and sleeps My Little Pony (she's wandering around the house carrying one as I type this) I think she would go ape over the set. My daughter would love this dvd - thanks. Another pony my daughter likes is cherrilee.